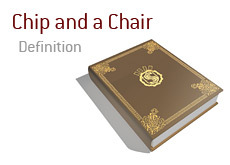 What does the term "chip and a chair" mean in poker? What is the definition of the term "chip and a chair"? The term "chip and a chair" means that as long as you have a single chip and a seat at the table in a tournament, you can still come back and are not dead yet. The term is thought to have originated from the 1982 World Series of Poker main event, which was won by Jack "Treetop" Straus. Straus was thought to be eliminated from the main event after losing a sizable pot, only to discover that he still had a single $500 chip hidden under a napkin (that's how the story goes, anyways). Straus didn't declare himself all-in, so he was allowed to continue playing with his single $500 chip. Straus ended up going on a run, and eventually went on to win the main event, despite the fact that he was certain that he had been eliminated. "As long as I have a chip and a chair, I'm still alive in this event." Jack's epic comeback in the 1982 World Series of Poker main event is proof positive that you should never give up in a tournament, even if you are down to hardly any chips. You just never know what could happen. Straus ended up winning $520,000 in the 1982 World Series of Poker main event, which translates into about $1.17 million in 2010 dollars.